Editor’s note: The Ministry of Education lately released the programs that won 2018 National Teaching Achievement Award (NTAA). Seven programs from Peking University were given the title. The NTAA is considered on a par with National Natural Sciences Award, National Technological Invention Award, and National Technological Advancement Award. To work with PKU Office of Educational Administration and PKU Health Science Center News, PKU News set up a special column titled “Survey of National Teaching Achievement Award” to deliver the interviews of the seven awardee programs, so as to display PKU people’s spirit of remaining true to their original aspiration and keeping their mission firmly in mind, the love of and devotion to the teaching cause, the pursuit of academic rigor, learning, and reform and innovation. At the same time, the column shows PKU’s development in talents training and achievements in teaching reforms. About the awardee program: “ Revision of China’s Undergraduate Medical Educational Standard and Implementation and Perfection of Clinical Medical Major Accreditation System ”, co-authored by Cheng Boji, Ke Yang, Wang Weimin, Xie Ana, Cai Jingyi, Lu Yingqing, Yang Jinhua, Wang Qing, Yang Libin, Li Yan, and Qu Bo, won the first prize of NTAA. 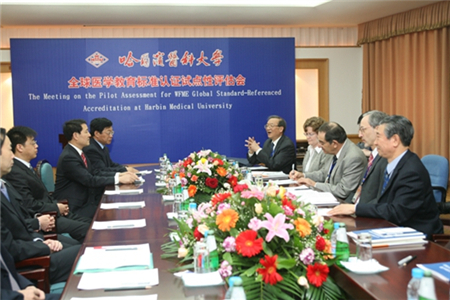 By amending and improving the 2008 edition of “ Standards for Basic Medical Education: Clinical Medicine ”, the program established “ Accreditation Standards for Basic Medical Education in China: Clinical Medicine (2016) ”, which set up the accreditation for medical education with Chinese characteristics and equivalent of international qualities. It also played an important role in regulating our country’s education in medicine, ensuring quality, deepening reform and promoting internationalization. As an external quality evaluation system, accreditation for medical education is to review and evaluate medical schools or educational programs according to established standards and procedures. Its purpose is to make sure whether the medical school or the educational program reaches the standards and to encourage medical schools to improve their educational qualities according to the standards. China’s accreditation for clinical medical education can be traced back to the beginning of this century. Since 2002, China has started the research and establishment of a national accreditation system of medical education. In 2008, the Ministry of Education (MOE) and the former Ministry of Health co-published “ Standards for Basic Medical Education: Clinical Medicine ”. Along with the founding of MOE’s Working Committee for the Accreditation of Clinical Medical Education (the Working Committee) and Experts Committee of the Accreditation of Medical Education, the publication symbolized the establishment of our country’s accreditation system of clinical medical education. With the development of medical education, the original standards lagged behind in terms of ideas. The World Federation for Medical Education (WFME) made a new revision of its standards in 2012, which brought about both pressure and motivation for domestic medical educational professionals to keep up with the international pace. From 2012 through 2016, depending on the research team of “Strategic Research of the Implementation of China Accreditation for Clinical Medical Education”, the Secretariat of the Working Committee made a general revision of the original standards and completed “ Accreditation Standards for Basic Medical Education in China: Clinical Medicine (2016) ” and “ Guideline for the Accreditation of Basic Clinical Medical Education (2016) ”. According to the internationally accepted accreditation standards, the Working Committee formed an accreditation procedure of “accreditation application—self-evaluation—on-the-spot inspection—accreditation feedback and report—sustained improvement”. The committee also created a China model of pre-accreditation inspection and return visit, which demonstrates the principal of “promoting building by evaluation” and “sustained improvement”. During the ten years of the accreditation work, the Working Committee set up an expert pool of more than 200 domestic experts and over 20 international experts. For each on-the-spot inspection, experts with different disciplinary backgrounds such as clinical medicine, basic medicine, preventive medicine, medical education administration, pedagogy, humanities and social sciences, and medical ethics would be selected to constitute the inspection team. Focusing on aspects such as the medical school’s training objectives, the curriculum, the educational resources, students, the faculty, educational administration and future development planning, the inspection team conducted the on-the-spot inspection and formed the accreditation report within two months after the inspection. Yang Jinhua, one of accreditation experts and the former Executive Vice Dean of Shantou University Medical School, introduced, “The accreditation team would hold an inspection meeting on a daily basis and submit the feedback afterwards. People would often discuss heatedly. I remember that one meeting even lasted till three or four o’clock in the morning.” Although it was hard work, the accreditation yielded a feeling of achievement. “I’ve been doing just one thing in my life, which is medical education. The accreditation work has realized our dream of promoting the in-depth reform of China’s medical education.” Yang commented. By the end of 2017, altogether seventy-three medical universities and colleges (which accounts for 47.7% of all the schools that have clinical medicine major nationwide) have received the accreditation for clinical medicine. Problems and weaknesses of the universities and colleges have been identified and solved with the accreditation. In some of the medical universities and colleges, there was the problem of blind enrollment expansion. Therefore the limited teaching resources were unable to guarantee the teaching quality, which not only harmed students’ benefits, but constituted a resource waste for the society. There was one medical university that had an enrollment size of 1200 students. “Then we discussed and asked the university how they conducted the anatomy class and whether they had enough body donors. If learning was only made through observation and video watching, how could they guarantee the teaching quality?” commented Wang Zhifeng, one of accreditation experts and professor from PKU School of Public Health. After the accreditation, the university reduced the enrollment to 600-800 students, which matched with its hardware conditions. Furthermore, for a medical university/college, one of the basic requirements is to have a third-grade class-A hospital directly affiliated to it. However most of the newly built medical universities and colleges were up to par. With the accreditation including that as one of the basic standards, some schools were pushed to negotiate with local departments of health and solved this difficult problem. There are many similar examples such as clarifying training objectives, normalizing educational behavior, improving evaluation system, promoting educational reform, and exploring an administrative system conforming to medical schools. The accreditation has brought about real benefits for medical universities and colleges. According to the survey of medical universities and colleges awareness of the accreditation of clinical medical education, 95.7% of the schools acknowledged a positive effect on the building of clinical medicine, and 100% considered the preliminary report by the accreditation expert team pointed out key problems of the school. Through the accreditation, the MOE drafted and published the first educational standards and guideline in China’s modern history of medical education—“ China Guideline for the Accreditation of Basic Clinical Medical Education ”, and revised and published the “ Standards for Basic Medical Education in China: Clinical Medicine (2016) ”. The 2016 edition of standards reflects international trends of medical education, domestic status quo and social anticipation, which provides a basis and guidance for the running of clinical medical education. Cheng Boji, Secretary-General of the Working Committee, emphasized, “The accreditation of clinical medical education does not pursue a unified model, but instead decides if the school can meet the basic requirements while respecting the school’s autonomy of running.” On this basis, the medical universities and colleges can have enough space and freedom to show their own characteristics. The 2016 edition of standards falls into two parts: the basic standards and the development standards. The basic standards are the ones that all the schools that have clinical medicine major must meet, which are expressed with “must”; the development standards are the higher standards internationally advocated for basic clinical medical education, which reflect the development direction for medical education, and are expressed with “should”. Therefore, the standards can be applied respectively to different medical schools based on their different phase of development, different resources, and different educational policies. The accreditation has always been carried out with a view to the sustained improvement rather than the competition for ranking. “In the precondition of complying with the law of medical educational development, schools should measure themselves with their own rulers. For example, PKUHSC and Weifang Medical University are totally not comparable. What we want to see is if a school can meet its own goal, and if it complies with basic standards or development standards.” Explained Wang Weimin, Deputy Secretary-General of the Working Committee. “When it was proposed for the first time to establish the accreditation system for China’s clinical medical education at the Beijing meeting in 2002, representatives from more than forty Chinese universities and colleges expressed doubt. At the first training meeting in 2009, representatives from over fifty schools expressed the same doubt. I admit that I in private doubted if the adventure of accreditation would work in China. But ten years later, reviewing the comprehensive development report inspired me a lot and hence increased confidence. China’s accreditation of clinical medical education has actually gone beyond my expectation, and realized the goal and significance of accreditation.” Commented Laurie Geffen, global advisor of accreditation from Australian Medical Council, who participated in the accreditation as foreign expert. From doubt to confidence, China’s accreditation of medical education has been steadily gaining worldwide recognition. Up till now, all the medical universities and colleges that have passed China’s accreditation of clinical medical education are marked in the World Directory of Medical Schools, which becomes an important standard for graduates to practice medicine internationally. 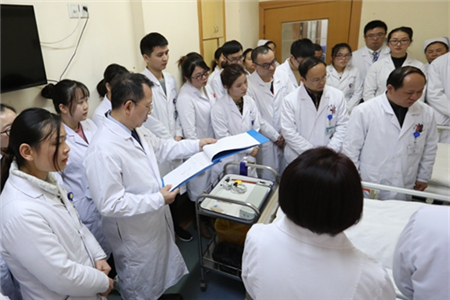 From its launching till now, China’s accreditation of clinical medical education has been receiving constant guidance and support from relevant administrative departments, and facilitating the implementation of the strategy of “Healthy China”, where PKU came in with its responsibility. “The government needed a third party to accomplish this, and the Secretariat established at PKUHSC played a very important role.” Commented Ke Yang, Vice Chairman of the Working Committee. Just as Wang Qiming, Deputy Director-General of Department of Higher education of MOE, expressed, “China’s accreditation of medical education will not only form a high-quality accreditation system with Chinese characteristics and international substantial equivalence, but contribute to the world standards for medical education China experience, China wisdom, and China plan.” Presently, China’s accreditation of clinical medical education is moving steadily toward that goal. Note: The Secretariat of the Working Committee provided help with this article.